Welcome to The Nose Clinic based in London, the specialist Harley Street rhinoplasty clinic, for both cosmetic nose surgery and functional nose surgery. All procedures are performed by Mr Julian Rowe-Jones, regarded as one of the best nose surgeons currently practicing in the UK. As we only perform rhinoplasty procedures we have an unsurpassed reputation for surgical excellence whilst creating natural looking, individual noses. We combine this with the highest possible levels of patient care, sensitivity and support. Our clinics in Harley Street, London and Guildford are also equipped with the latest imaging technology so you can see what your new nose will look like before any surgery is performed. Julian Rowe-Jones is a world-renowned specialist in functional and cosmetic nasal surgery and has been practising since 1986, after qualifying from St. Thomas’ Hospital Medical School. He received his specialist surgical training in London Teaching Hospitals and became a Fellow of The Royal College of Surgeons of England in 1992. You can read more about Julian’s specialist experience here. 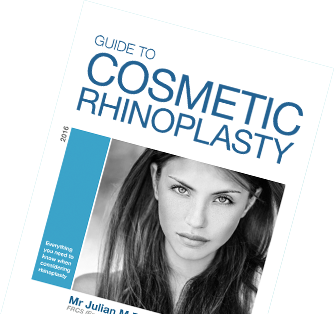 For more information on nose jobs, download our FREE Guide to Cosmetic Rhinoplasty, written by specialist surgeon, Julian Rowe-Jones.